The 4-masted barque Pamir, after 44 years of sailing the oceans, commencing her last voyage as an engineless sailing ship. In the sleepy, little Spencer Gulf town of Port Victoria, 29 May came and went with seemingly little to distinguish it from other days. However, a noteworthy event was about to be enacted. A vessel laden with 60000 bags of barley, slid quietly away from her anchorage. There was no throb of engines, just the shouts from her crew; the sounds of sheaves in wooden blocks and the slatting of great sails being swung to the wind. The 4-masted barque Pamir, after 44 years of sailing the oceans, was commencing her last voyage as an engineless sailing ship, around Cape Horn to the UK. Sailing two days later was the 4-masted barque Passat, shown in the distance, both with the same destination. This denoted the end of Spencer Gulf’s association with the grain ships and the end of the era of the commercial sailing ship. When they completed this voyage Pamir and Passat were laid up at Penarth, Wales as grain storage ships before being sold to the shipbreakers. 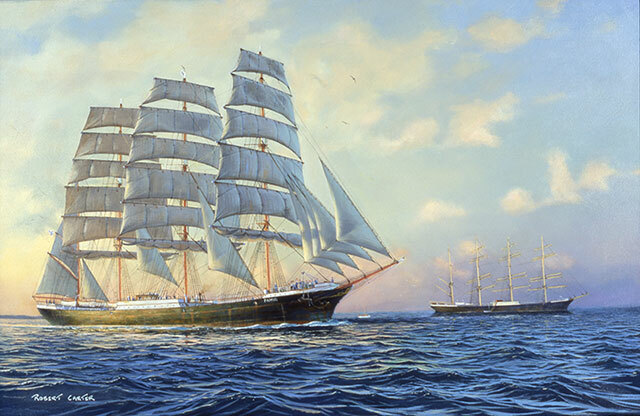 They received a reprieve when Heinz Schliewen, representing a group of German Shipowners, bought them and with auxilliary engines and other modifications they became cargo carrying training ships, sailing between Germany and South America until 1957, when Pamir was overwhelmed by a hurricane in the North Atlantic. Passat was withdrawn from service and put on display. After 50 years moored in Lubeck, Germany, as a depot for community activities, she has been completely refurbished to sailing survey. 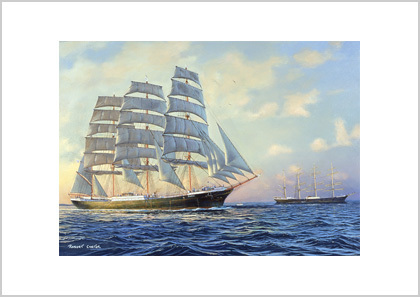 This painting was commissioned by Aland Post for a stamp to commemorate the 50th anniversary of the last voyages by these two ships.